Really FINE memories all! 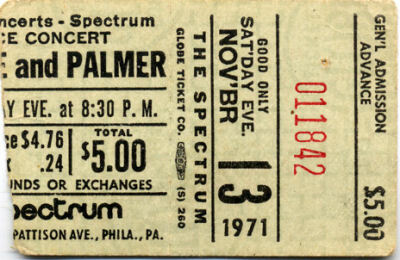 I was there that nite at The Spectrum also [which is coming down next month] and they did the entire Yes Album & practically everything from Fragile. I remember the equipment failures & it mattered not one single bit. Oh JOY - Oh RAPTURE ! ! ! By time Keith Emerson, in the middle of ELP's set, [fresh off the "Community" doob :-] started doing mid-air circles with his Hammond & began throwing "knives" into a fake spkr cabinet, 9 of us looked at each other, and without a single word, our entire row [15th row/Floor/Center!] got up and quietly left the theater . . . We all sat in the van in the parking lot, and tried to come to terms with what we'd just experienced, like the transitions in & out of the 2 main parts of Perpetual Change ;-] and as you said, We were never quite the same after that night. Squire [marching up front, proudly with Anderson] & Bruford have to be the finest rhythm section ever born to this planet. [Sure there were a few others, McCartney/Starr, for example, but U all know what I mean]. It's a shame they grew to hate each others guts . . . .
To listen to "Fish Out Of Water" 4 yrs later, you'd never know it. I was at this show from the "Fragile" tour as well. I remember that by the end of their set, the only Keyboard that Rick had working was his Fender Rhodes, and they were still amazing. I also remember Bill Bruford sitting behind Carl Palmers drumkit onstage(!!!!) while ELP played their set. Electric Factory Concerts had alot of vision back in those days. Imagine seeing YES & ELP together in concert! Even by todays standards, that is a huge bill. BTW, Michael Snyder is a great Drummer in his own right. Wow, I was there. I remembered seeing both bands but realize now that Yes AND ELP were together. Yikes. My son is amazed and I am now 51 in 6 days. All I remember about the show is that I LOVED it, yet I didn't understand a single word they sang. My friends and I kept calling the local radio station for weeks afterward requesting "The Karma Song" (I've seen all good people)...They were (and ARE) so magestic!!! Despite all of the problems that abounded that night, anyone there was never the same. Bruford's floor tom's in Your Move echoed like cannons - it was wonderful. Everyone looked great. Wakeman had jut joined and the Fragile album was yet to be realeased. I read that they were very disappointed in the show that night. Believe me, with all of the problems, they proved that they were a force to be reckoned with. I was heartbroken when Bruford quit. Admit it. They were never the same afterwards. Nearly everything went wrong with their equipment & the crowd went nuts! They were brought back more than once -- they were 1st on a bill of 3 (?). They vowed that their next Philly show would be special & of course, it was. Also, DJ Ed Sciaky had greeted them upon arrival in the US in NYC & came down with them to Philly.